In the past few years, new methods of gas production have led to surpluses in natural gas. Natural gas that is unusually rich in ethane, propane and butane is being produced in the Mid-Atlantic States and the South West. This rich gas can be separated into its components by cryogenic or high pressure gas separation plants. Once separated, the methane can be added to a natural gas pipeline, while the propane and butane can be handled as liquids and trucked to users. The ethane is different. It cannot be handled as a liquid and cannot be added freely and without strict limitation to a natural gas pipeline. It could be added to a dedicated pipeline, but few such pipelines exist. If such a pipeline is located, the cost to add it to the pipeline and export it to a distribution facility, like that in Mont Belvieu, Texas can cost more than the ethane is worth. Natural gas in pipelines contains mostly methane and cannot contain more than few percent of ethane and heavier hydrocarbons by regulation. Today, ethane is generally used for production of ethylene. There are several chemical production facilities in Texas and Louisiana that convert ethane to ethylene, but there are relatively few in the Central and Mid-Atlantic States. The ethane that is produced in gas separation facilities in West Texas, New Mexico, North Dakota, Ohio, West Virginia, Pennsylvania and similar states is a long way away from the ethylene production plants that are found predominantly on the Gulf Coast. In effect, this ethane is stranded. At an ethane distribution facility ethane is worth about $0.30 per gallon today. Unfortunately, transporting the ethane to the distribution facility through a pipeline can cost $0.30 to $0.40 per gallon. In many locations, ethane has become a nuisance instead of an asset. The Synfuels GTL technology works much more effectively with ethane and heavier hydrocarbons than methane. Although Synfuels GTL technology converts low value methane and methane rich gas to gasoline blendstock economically, it works far better with ethane and heavier hydrocarbons. The Synfuels process can make about 50 barrels of gasoline blendstock from 1 MMSCF of methane, whereas it can make about 175 barrels of gasoline blendstock from 1 MMSCF of ethane and nearly 200 barrels of gasoline blendstock and lighter components such as propane and butane when situated near and integrated with a gas separation plant. All FT processes convert hydrocarbons to carbon monoxide and hydrogen from which they re-grow hydrocarbons on a catalyst. An FT process treats all carbons the same, no matter if it is from methane, ethane, propane or butane. All feed hydrocarbons to an FT process are converted to CO and H2. The Synfuels process treats ethane and heavier hydrocarbons much differently. Instead of breaking all of heavy hydrocarbons into single carbon species as the FT technology does (i.e. CO), the Synfuels process removes only 2 or 4 hydrogens. The result is more product from a gentler process without changing the operation. The Synfuels process produces about half acetylene and half ethylene when the feed is ethane or heavier, which is an added bonus. The ethylene that is produced directly does not have to pass through the hydrogenation step. Starting with 1 MMSCFD of ethane, we make about 175 bbl of saleable product whereas an FT process can make only 135 barrels of saleable liquid fuel. Although Synfuels makes 35% more saleable product than an FT process when starting with ethane, our capital cost is still about a third. All of these benefits of using ethane and heavier hydrocarbon feed accrue naturally for the Synfuels process. The same Synfuels technology works for C2+ and methane containing gases. The same plant could process pipeline natural gas, rich associated or flare gas, or C2+. The only thing that would change substantially is the productivity. Ethane and heavier gases result in a much higher yield of saleable product. 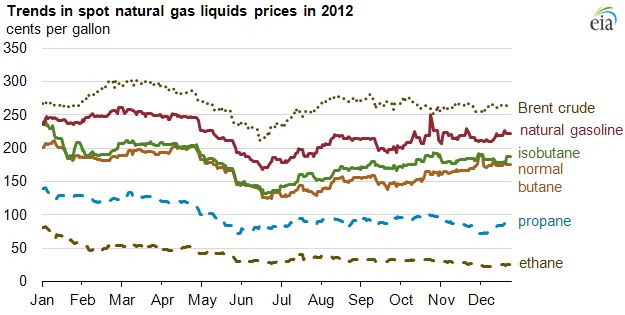 Natural gas values are currently about $4.20/mmBTU2 although the US Energy Information Administration (EIA) expects the 2013 price to average about $3.80 in 2013 and $4.00 in 20141. Recent RBOB prices in late April 2013 ranged from about $2.79 to $3.00 per gallon3. The following EIA chart shows the price history of several fuel type commodities. Currently propane is about $0.95/gallon3, butane about $1.80/gallon and ethane is about $0.30/gallon. 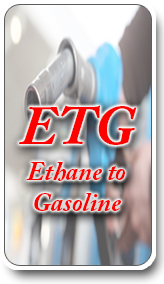 At $0.30/gallon, the heating value of ethane is equal to that of natural gas costing $4.60/mmBTU. For the economic analysis of a Synfuels gasoline blendstock production plant, we assume we are building a plant capable of processing 30,000 barrels of ethane per day. Electricity cost is $0.06/kW, sulfur free gasoline blendstock value is $3.00/gallon, and the time to build the plant is 3 years. This plant will produce 2.8 million barrels of gasoline blendstock per year. It will cost about $252 million to construct, but EBIDTA is projected to be $170 million. The projected IRR is 58% and the projected Annual Return on Capital is 67%. There are many different scenarios. There are more opportunities to obtain ethane feeds of 10,000 barrels per day or less from individual gas separation plants. Smaller plants are less economical because they have the same complexity of a larger plant and require the same instrumentation, crew, safety design, etc. However, even for a plant processing only 10,000 barrels per day the IRR is still projected to be 43% and the EBIDTA is projected to be $54 million. Here is a chart that describes the projected cost of a Synfuels ethane to gasoline blendstock production facility as a function of gas feed rate. The greatest impact on economics is the gas feed cost. Ethane price has varied widely over the past half decade. From a high above $1.40/gal to a low around $0.20/gallon, the current price around $0.30/gallon is expected to hold for as long as gas production continues to be high; a result of fracing, and new finds continue to be rich in NGL’s. Long term prices are expected to remain in the $0.30 to $0.40 range for the foreseeable future4. 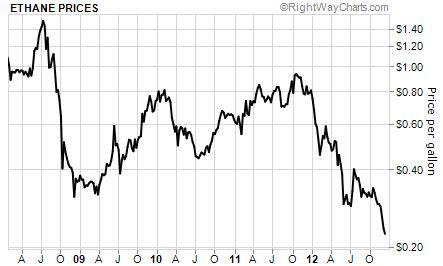 The average price for ethane from the chart below since mid 2008 is about $0.55/gal. Deducting a transport cost of $0.30/gal, the site value of cryogenic ethane becomes $0.25/gal, which is below its BTU equivalent value. 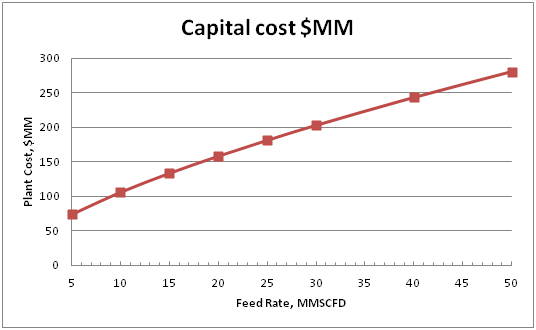 For the 50 MMSCFD case presented above, the feed ethane price must reach 67 cents per gallon before the production plant stops making a profit. This equates to a site price of nearly a dollar per gallon, which was only reached briefly prior to the 2009 recession, well before fracing made rich natural gas so abundant to North America. Clearly, as already discussed, the Synfuels ETG process is fundamentally more efficient than any FT process while the capital cost is much less. 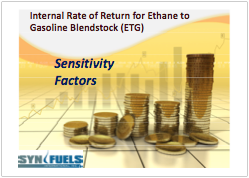 Low value ethane can be transformed into high value gasoline blendstock. Ethane owners can now compete in the liquid fuel market rather than be relegated solely to the needs and price fluctuation of the chemical market and the whims of the pipeline owner whose price to carry gas and capacity to carry gas can change substantially and without warning. Another grade of product produced at gas separation plants is called Y-gas, which is a mix of about 20% to 50% propane by volume with ethane. This gas has a higher energy value than ethane, but because it is impure, often has the same value as ethane. 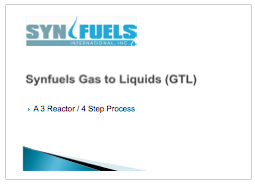 In the Synfuels process, the same volume of Y gas yields more saleable product. On a gas volume basis, a 50/50 mixture of ethane and propane would yield about 46% more product than ethane alone which could substantially increase production while feed costs are maintained. Y-gas is widely available. A Synfuels ETG plant, located near to its feed source, will produce local jobs and transportation fuels. The Central states are hungry for jobs and Synfuels ETG plants will bring high paying technical jobs to Central State communities. Investment returns of 25% to 80% in a Synfuels ETG plant promise long term interest and employment opportunities. Synfuels Gasoline Blendstock is sulfur free and won’t produce sulfurous acid gases when used as fuel in cars and trucks, which is better for the people and the Central State ecosystem. Fuel produced locally from local natural resources costs less. Fuel that is not imported from distant states and ports keeps local money at home and working in the local economy. Fuel made at home does not carry the burden, expense and risk of international Oil Markets and the whims of OPEC. America needs to be Energy Independent. The rapid expansion of fracing technology has made natural gas much more available in just a few years. 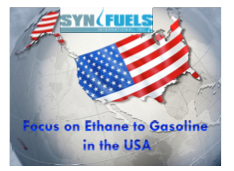 The Synfuels ETG technology can transform an abundance of ethane and Y-gas into clean gasoline that Americans want and need to enhance the quality of their lives and grow their businesses. Synfuels ETG is an American Technology that is available today for a Burgeoning American Opportunity.